In a busy pharmacy, keeping up with dispensing volumes is critical in maintaining good customer service. 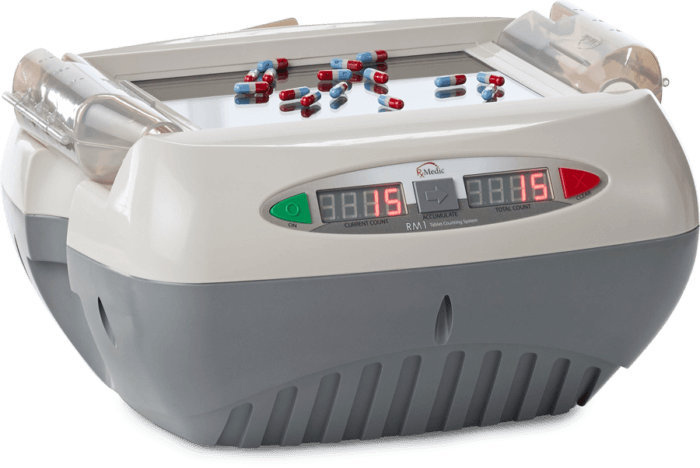 The RM1 is a powerful, vision-based pill counter designed to quickly and accurately count solid oral medications without having to calibrate. As prescription volumes grow, stress on your team increases and medication errors frequently occur along with customer frustration as they wait. Our fast, simple to use RM1 Pill Counter can help…simply pour out the pills and watch it count almost instantaneously. Its unique “Accumulate” function is also perfect for Narcotic Counts or Inventory management, saving time and money while increasing user accountability. Counts meds without any calibration in seconds… simply pour the pills on the glass.